DHS has analyzed the likelihood of Anonymous attacking industrial control systems (ICS) after the hacktivist group showed such intentions earlier this year. "Assessment of Anonymous Threat to Control Systems" that was drafted by the National Cybersecurity and Communications Integration Center (NCCIC) back in September. The document is not classified, but it is intended for official use only. 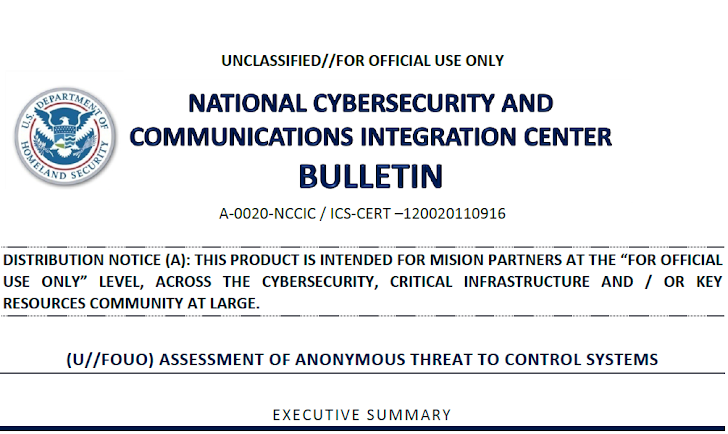 The report describes an interest within Anonymous to target industrial control systems. "The capability of the individual to recognize and post code that would gain the attention of those knowledgeable in control systems, as well as their claims to have access to multiple control systems, indicates the individual has an increased interest in control systems, but does not demonstrate capabilities," the NCCIC said in its report.